Sometimes a picture really is worth a thousand words. The charts above show how four of the largest Wall Street banks traded like clones of one another yesterday. 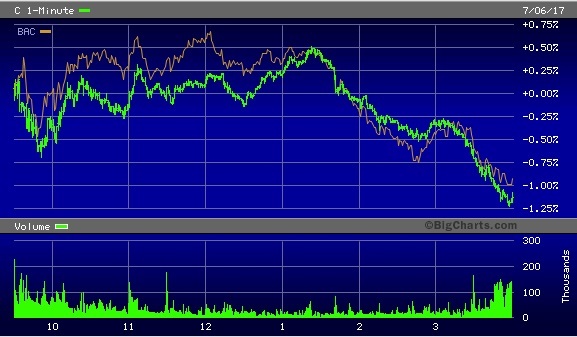 Their share prices rallied at almost identical times and the rallies faded at almost identical times. 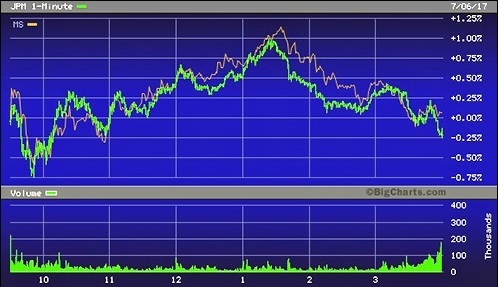 The chart contrasting the trading pattern of JPMorgan Chase and Morgan Stanley is particularly interesting. JPMorgan’s Chase bank has thousands of retail commercial bank branches spread across the United States. Morgan Stanley, on the other hand, has approximately 17,000 retail stockbrokers, now known as financial advisors. What both firms have in common is that they are among the five banks in the country that control a monster pile of derivatives on Wall Street. Ditto for the other two banks illustrated above: Citigroup and Bank of America. According to the most recent data from the Office of the Comptroller of the Currency (OCC), the regulator of national banks, as of March 31, 2017 the following five bank holding companies controlled the lion’s share of the derivatives market: Citigroup held $54.8 trillion in notional (face amount) of derivatives; JPMorgan Chase held $48.6 trillion; Goldman Sachs Group had $45.6 trillion; Bank of America held $35.8 trillion while Morgan Stanley sat atop $30.8 trillion. According to the OCC report, the top 25 bank holding companies controlled a total of $242.3 trillion in notional derivatives at the end of the first quarter of 2017, with these five bank holding companies accounting for 89 percent of that amount. Previous Post Catalonia and Spain to Push Each Other into Financial Abyss?